Prachanda Vs. Rajesh Hamal: Who is a better actor? 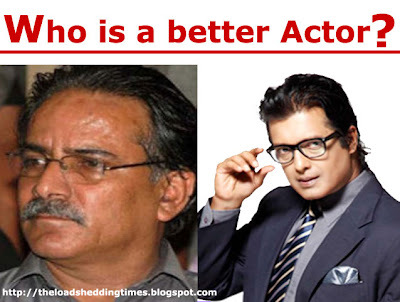 HomePoliticsPrachanda Vs. Rajesh Hamal: Who is a better actor? Seeing the multiple personalities of the chairman of Unified Communist Party Nepal (UCPN) Maoist, Mr. Pushpa Kamal Dahal (Prachanda), I have run into a confusion about the best actor of Nepal. Until now, Superstar Rajesh Hamal is considered the king of Kollywood, i.e., Nepalese film industry. And although some people will disagree, many people have believed and still continue to believe him as the king of acting too. However, recently during the revolt of "Nepal Adhibashi Janajati Mahasangh", most of the people started doubting the capabilities of (Rajesh) Hamal as the best actor of the Nepalese film industry. Once upon a time there was a very greedy (and mean as well) politician. He was so greedy that he could do anything to get votes from the people. Telling a lie was, in fact, nothing for him. He could say one thing to the people of one region. And if the people at the next region had desires just opposite to that of the former region, he would say that their demands will be addressed as well. Similarly, if people at yet another place had a demand conflicting with that of the former two places then he would still say that their demands would be fulfilled as well, just to get some more votes from the people of that region. Yeah, he could literally change (steer) "east" to "west"! Prachanda bears the similar characteristics of the politician described in the example above. No one in the film industry of Nepal has ever played a double to triple roles as good as Mr. Prachanda did. Therefore, Prachanda seems to have good future in the film industry; I am not much sure about his political career though. So, literally the acting capabilities of Rajesh Hamal are being challenged by the emerging artists like Prachanda (and you know, Prachanda is excellent at dancing; he has already danced with actress Rekha Thapa in the People's Movement 2062/2063 BS.) So, our beloved Rajesh dai, remain alert and watch out such threats otherwise you'll soon become a history! Long live the new Superstar Prachanda!